Our range of products include natural ruby. A ruby is a pink to blood-red colored gemstone, a variety of the mineral corundum (aluminium oxide). 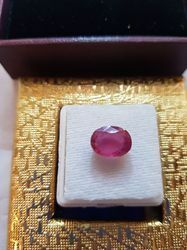 Other varieties of gem-quality corundum are called sapphires.Ruby is one of the traditional cardinal gems, together with amethyst, sapphire, emerald, and diamond. The word ruby comes from ruber, Latin for red.